In Delhi during the protest, the additional Secretary of UGC Ms. Pankaj Mittal had to come out and talk to the students. She could not give any concrete assurance and only fueled further confusion. The students have given one week’s time to the UGC for coming out with a clear notification on the status of bi-annual NET, restrictive cap and number of JRFs. If the UGC does not clarify its position within one week, our movement will intensify! AISA protested against the UGC and MHRD for reducing the scope of NET-JRF examination drastically by holding the NET exam once instead of twice a year and reducing the number of students qualifying NET from present 15% to a meagre 6%. AISA held protest demonstrations in different Indian cities namely Patiala, Chandigarh, Delhi, Allahabad, Lucknow, Ara, Darbhanga and Kolkata. a) What happened to the June-July NET exam? b) Why do the number of NET qualifying students being decreased from 15% to 6 % ? c) Why did the UGC take the decisions without a proper notification? d) Do the number of JRFs also being decreased? The additional secretary quite naively told that June-July NET exam will happen but it is being postponed slightly.It is in common knowledge that notification for November exam is already out. The second question is answerd in a vague manner where she claimed in effect number of NET qualifying students will increase. She told that the issue of conduction of exams are not being discussed with UGC and it is under the purview of MHRD and CBSE. She told that no final decision has been taken on conduction of bi-annual NET examination. See the video here. AISA demanded that a proper notification should be published on the UGC website clarifying the confusions around bi-annual NET and the 6% cap within 1 week. AISA resolved to go on a bigger agitation after looking into UGC’s clarification. See Also: Letter of AISA activist Nitin from jail. On 22 June, a 15 year old Muslim teenager Junaid who was travelling from Delhi to Ballabgarh in a local train EMU train was lynched by a mob in the train. His brother Shakir was also badly injured. Shakir is currently admitted in the AIIMS trauma centre. A team comprising of Com. Niraj (DU, AISA), Com. Santosh Rai (AICCTU DTC in charge, Delhi), Com. Zeeshan Ahmed (CPI-ML, Delhi unit) along with other activists went to meet Shakir in the hospital. They talked to Shakir there and Shakir shared with them his address and father’s name. On the morning of 25 June, an AISA-CPI (ML) team went to meet his family at their residence. The team comprised of AISA National Secretary Com. Sandeep Saurav, JNU AISA activist Com. Geeta, CPI (ML) Delhi activist Com. Zeeshan and CPI(ML) Haryana unit activist Com. Anil. This report has been prepared based on their meeting with Junaid’s brother Hashim and their other family members, neighbours and friends. For the family of Jalalludin, who resides Khandawali village, about 4 kms from Ballabgarh, the period of joy suddenly turned into a period of mourning and grief. The promising boy of their family, Junaid who used to study in a Madrasa- Faiz-e-Subhaniya in Mewat, had come home for Eid. He had finished his study of Quran and the time had come for him to be called a ‘Hafiz’. The festival of Eid was also approaching. The family happily handed over money to their children to buy clothes from the market and got busy in the preparations for Eid. The team met the family. “I had come to Delhi with my brother Junaid and two friends from our neighbourhood- Moin and Mohsin. We had come to purchase things in preparation for Eid. It takes approximately 45 minutes to come to Delhi from Ballabgarh in train. In the evening, after completing the shopping, all four of us returning home by train. We had boarded the train from Sadar. The crowd in the train was slowly increasing. The four of us sat across each other in the train. After some time, a 70-80 year old man got onto the train and Junaid left his seat for him so that he could sit. Pushing and shoving began in the train from Okhla station. Around 20-50 people had got in the train together from Okhla. Junaid was standing at this time and suddenly because of all this pushing and shoving he fell down on the floor of the train. Junaid and I requested people to not push. At this, someone from the crowd snatched my cap, threw it on the floor and crushed it with his feet. After this they caught my beard. When we tried to stop them, they started beating us. They started shouting that-they are Muslims, anti-nationals and beef eaters. After this, the other people training in that coach also almost joined those people. Nobody tried to stop them. They were 10-15 of them and were beating us mercilessly. After the train crossed Tughlakabad station, I called my brothers and informed them and they all came to Ballabgarh station. However, when the train stopped at Ballabgarh, these people did not let us get down. They had together held us four. After this, my elder brother Shakir and some other friends who had come to take us also got onto the train. They started beating them too. As soon as the train started from Ballabgarh, one of them took out a knife. The knife has sharp teeth. He attacked Shakir with this knife. After attacking him with knife they were pushing him around inside only. When Junaid and I went to save him, they attacked me and Junaid with knife too. The next station was Asaoti, about 10 minutes way. But within this time they had killed my brother Junaid”. When the team was talking to Hashim, he was lying on the bed. He had also suffered knife injuries in several places- on shoulders, legs and feet. Along with Hashim, a relative of theirs’ Asruddin was also present. They expressed hope that the all peace- loving people across the country will raise their voices on this issue. On the eve of Eid on 26 June too they have decided to demand justice for Junaid and keep this issue in the forefront of protests. Their assaulters must be arrested immediately and punished. They informed the fact-finding team that several organisations and the Nuh Madrasa have decided to read Namaaz wearing black bands in protest. They want that in Delhi and other places- voices be raised, since this matter is about several innocent youth like Junaid who are being murdered by violent lynch mobs and as hatred is being sown in the society and in the country. 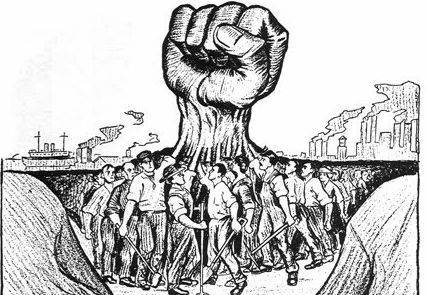 March Forward With Working Class Struggles For a World Free From Exploitation! 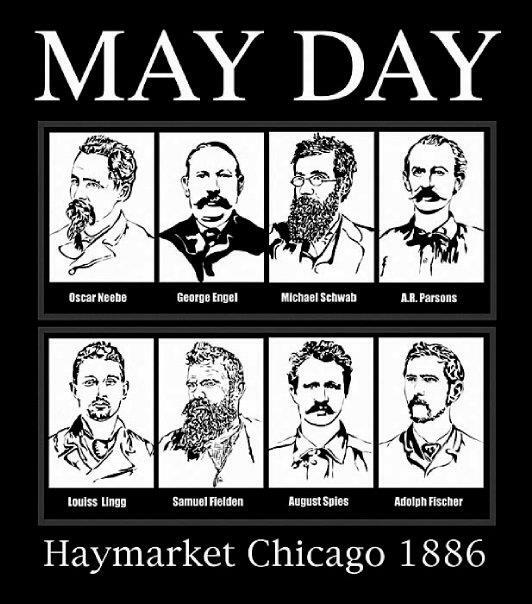 131 Years of May Day: Remembering the Haymarket Martyrs! On 1st May Indian workers will join workers around the globe to celebrate the May Day – the international day of the working class. In India we have seen how the ‘sedition law’ is used to target the voices of justice and people’s resistance in society. August Spies was charged with the ‘crime’ of distributing ‘seditious’ material in the form of the German workers’ newspaper. He responded by reading out, in Court, extracts from the ‘respectable’ ruling class newspaper, which openly advocated the most brutal forms of violence against political opponents, especially the working class. The fights of the working class and their blood spilt in the course of those struggles in the past 130 years since the Haymarket martyrs achieved many rights for the working class. But on the other hand, in the recent times of globalization, the systematic violence on workers and consistent scuttling of their rights have also intensified. Eroding Labour Laws: The Modi Govt is desperately trying to “amend” almost all existing labour laws. This will keep 90% workers out of the scope of the safety of labour laws and surely allow unchecked license to “hire and fire”. The implementation of these anti-worker moves has already begun in BJP ruled states like Rajasthan. For instance among major changes, the Industrial Disputes Act now allows companies employing up to 300 staffers to lay off workers or close down without taking the government’s prior approval. Earlier, those with up to 100 employees were allowed to do so. Factories Act now applies to an establishment which uses electricity and employs 20 workers and which does not use electricity and employs 40 workers (earlier it was 10 and 20 respectively). Rajasthan government has also made getting recognitions for unions more difficult. The rush now is to impose the “Rajasthan model” across the country. Further, Modi government has, in a particularly shameless manner, called for “self-certification”. In place of inspection by the labour department, the owner of a company will annually certify whether the company is following all laws! Legitimizing Child Labour: The PM who claims to have been a tea-seller as a child, is the one legitimizing child labour today. The amendments approved by the Modi Government prohibit children between 14-18 from employment in hazardous occupations, while allowing children below 14 to be employed in ‘non-hazardous’ work in ‘family or family enterprises’. The argument given by the Government to legitimize child labour is that the ‘social fabric’ of the country would be damaged if child labour in ‘family’ work is banned. ‘Social fabric’ here is a common Sangh Parivar euphemism for caste hierarchy and caste-based division of labour. This is made clear by the Government official who told activist Harsh Mander, “What is wrong with this? Should not the son of a lohar or ironsmith, learn to be an ironsmith, or of a weaver to be a weaver?” Further, the phrase “hazardous” remains extremely narrowly defined, in reality offering no protection to children. Contractualisation and the Plunder of Workers’ Wages: The Modi Government shamefully does not agree to the long pending demand of trade unions to the issue of equal wages to the contract workers as per the rules under Contract Labour Act; on the contrary saying that all contract workers will be paid minimum wages! But this is already guaranteed by the law. This only exposes government’s tacit acceptance that workers are not even being paid as per the existing minimum rates by the employers and its keenness to continue with this illegality, in order to allow corporates to loot the hard earned wages of workers. Lowest Increment in Minimum Wages: The government is not introducing the much-needed raise in minimum wages according to the spiralling inflation and sharp price rise. The Modi government accepted the recommendations of the 7th Pay Commission which is said to be the worst so far from the point of view of workers’ interests as it recommends the lowest increment in minimum wages. Denial of Minimum Wages, Denial to Acknowledge Labour: The Government continuously has been refusing to recognize lakhs of Anganwadi, Mid-day meal, ASHA, Para-teachers and others as ‘workers’. They have been denied even their right of statutory minimum wages and allocations of funds for these schemes gets slashed budget after budget. Job-less Growth to Job-Loss Growth– Rising Unemployment and Mass Retrenchment: Employment opportunities have suffered enormously during the Modi regime. Data from the Labour Bureau showed that job growth in India had fallen to a six-year low in 2015. The survey shows that in the eight key labour-intensive industries, only 0.1 million jobs were created in 2015, even worse than the former low of 0.3 million in 2012. Very recently, we have seen mass retrenchment in leading Indian IT companies, from Wipro, TCS to Infosys. Indeed experts are terming the unfolding phenomenon as a down slide from Job-less Growth to Job-Loss Growth. Tax Exemptions and Willful Default of Bank Loans – Free Hand for Corporate Loot: In sharp contrast to snatching away of existing rights and violation of minimum wages of the working class, Modi govt has given a free hand to the crony corporates to loot our money with impunity. As per the admissions in 2017 Union Budget, during 2016-17, exemptions in corporate tax stands at a whopping Rs. 83,492 crore! Add to it humongous defaults in bank loans by the willful corporate defaulters. As per the estimates of “India Ratings”, the stressed loans (=Non Performing Assets + Restructured loans + Written off assets) with domestic banks are expected to be above a whopping Rs 13 lakh cr. (DNA, 13 May 2016). PSU banks have written off Rs 1.54 lakh crore bad loans during 2013-2016 June (PTI, 07 Dec 2016). More shockingly, Economic Times (20 Dec 2016) alerted that Rs 7.4 lakh cr debt is likely to be written-off! Sanghi Symbolisms to Curb Working Class Consciousness and Normalise Exploitation: When BJP was fighting the 2014 election, their manifesto had promoted the concept of “Industry Family”, in which “industry owners and labours bond as a family.” Inside the BJP’s patriarchal concept of ‘family’, there can be no room for Unions and workers’ struggles and entitlements; and the BJP Manifesto had, likewise, promised to “bring together all stakeholders to review our Labour laws”. In the name of “Industry Family,” patriarchal restrictions, abuse, and violence are used to discipline women workers. In the tradition of the good old feudal-patriarchal family, the ‘mai-baap sarkar’ has snatched away the rights of workers to promote the profits of corporates. Our Prime Minister has called himself the “Mazdoor No.1”, and his most powerful “maaliks” like corporate biggies Ambani, Adani and Hinduja are scripting the snatching away of all labour laws. At the same time, BJP leaders ranging from Yogi Adityanath to several other MPs, MLAs and other prominent figures, are openly inciting communal hatred, violence and killings on the pretext of ‘cow protection’, ‘protection of women’ and ‘counter-terrorism.’ They are seeking to divide India’s working class on communal lines, and ensure that the working class cannot unite against the attacks on labour rights and democracy. May Day is an occasion for the working class to reaffirm its resolve to resist such hate-mongering and communal violence, and rally to defend democratic rights and equality, not only of workers themselves at the workplace, but of every section of vulnerable citizens – including minorities, Dalits and other oppressed castes, and women. Why Is the RSS-BJP Afraid of May Day Legacy? BJP government is afraid of the worker’s struggle and the glorious history of workers’ movement. Last year, the RSS declared May Day as “alien” to “Indian Culture”. Few days back, the Haryana Govt of BJP said that it will not celebrate 1st May as Labour Day anymore, instead it will observe only Vishwakarma day. Let us point out that the workers who observe Vishwakarma Day need no ‘directive’ from the RSS or BJP to do so – rather the RSS and BJP are trying to appropriate Vishvakarma Puja and pit it against May Day! This clearly reveals that the BJP and RSS, serving corporate interests and eroding workers’ rights today, would like workers to forget the legacy of May Day entirely. 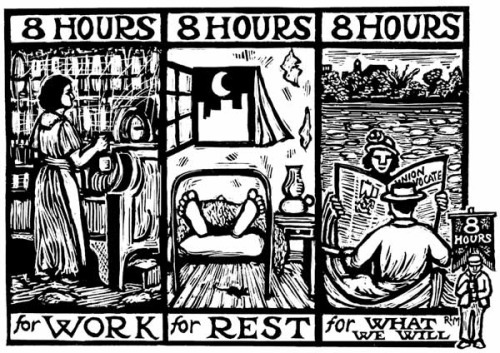 The Government seeking to make workers toil 12-15 hours a day, obviously wants workers to forget the history of struggle for an 8-hour day! Let us also point out that the religious festival of Vishwakarma Puja is traditionally a day for the artisans to celebrate their tools. 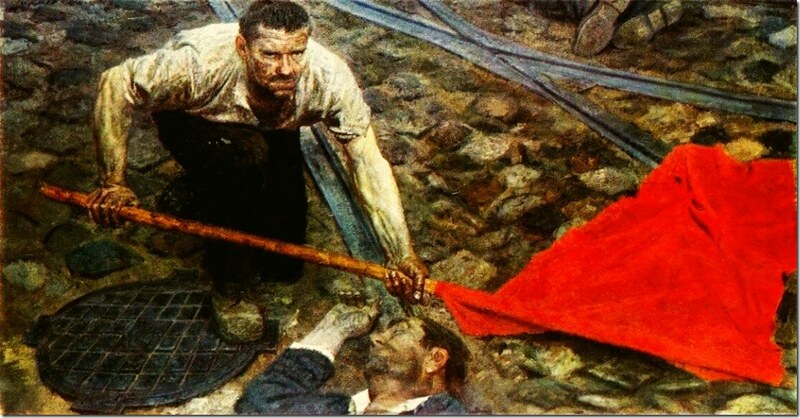 Today, when capitalism has snatched the tools from most artisans and monopolised all the means of production, and exploits workers’ labour, the meaning of May Day and workers’ struggle against capital is more relevant than ever! Deeply opposed to workers’ rights and struggle, the RSS-BJP routinely resorts to crafty wordplay to peddle its pro-worker image. Modi’s slogan of Shrameva Jayate (Victory to Work) is one such example. But look at the irony, while claiming to valorise work in the name of Shrameva Jayate, the RSS and BJP work for ‘Parajay’ (defeat) of the ‘Shramik’ (worker)! Today, global capital and their local agents are being given a free hand to exploit workers. MNCs based in the US are able to exploit the labour of workers in India or Bangladesh. At such a time, the message of May Day – of workers’ international unity and struggle against capitalism – is a message Indian workers will never allow to be forgotten. Last year’s historic general strike on 2nd September and the continuing workers’ protests across the country have succeeded to a certain extent in pushing the government back in the matter of amendments of labour laws. Workers have organized big strikes in the coal, transport, public and government sectors. In many States including Bihar, Jharkhand, Uttarakhand and Assam, ASHA, Anganwadi, midday meal workers and contract/honorarium workers in government departments have been organizing huge struggles. Women workers in Bengaluru’s garment industry opposed the Modi government’s assaults on their hard-earned PF money so massively that the government was forced to step back. Sanitation workers in Bengaluru recently won significant increases in their wages while in Mumbai, sanitation workers recently won a landmark court verdict regularizing contract workers. Pricol and Maruti workers have received solidarity from the working class all over India and the world in their struggle for justice. India’s workers are unionizing, uniting and fighting back – in the face of brutal repression! Fight Back Crackdowns On Workers Rights and Wages, Impunity for Corporate Loot and Communal Divisiveness! Long Live May Day’s Legacy of Working Class Struggle for Democracy, Freedom and Equality! जब हम डॉ. अम्बेडकर की 126 जयन्ती मनाने जा रहे हैं तो उसी समय मोदी की केन्द्र सरकार और राज्य सरकारों ने डॉ. अम्बेडकर के ‘शिक्षित बनो, संघर्ष करो, संगठित हो’ के नारे पर हमला बोला हुआ है, बल्कि इन सरकारों का लक्ष्य है ‘वंचित करो, उत्पीड़न करो, अलगाव में डालो’!! हम देख रहे हैं कि यूजीसी नोटिफिकेशन 2016 के बहाने जेएनयू व अन्य विश्वविद्यालयों में एमफिल/पीएचडी में नामांकन की सीटों में भारी कटौती की जा रही है. दिल्ली विश्वविद्यालय में स्ववित्त पोषित ‘स्वायत्त’ कॉलेजों के लिए रास्ता साफ किया जा रहा है. इसके बाद ये कॉलेज बड़े पैमाने पर फीस वसूली करेंगे और अध्यापकों की सेवा-शर्तों पर हमले करेंगे. पंजाब यूनिवर्सिटी में भारी फीस-वृद्धि के विरोध में आंदोलनरत छात्रों पर बर्बर पुलिसिया दमन किया गया और उनके उपर ‘देशद्रोह’ तक का चार्ज तक लगाया गया। इलाहाबाद विश्वविद्यालय में फीस को तीन गुणा तक बढ़ा दिया गया तथा स्नातक/स्नातकोत्तर के लिए न्यूनतम योग्यता को भी बढ़ा दिया गया। रोहित वेमुला के हत्यारे आज खुलेआम घूम रहे हैं और उन्हें पुरष्कृत भी किया जा रहा है। जेएनयू का नजीब अब तक ग़ायब है और उसके हमलावरों एबीवीपी को पुलिस, प्रशासन और सत्ता का राजनीतिक संरक्षण मिल रहा है। सभी संस्थानों के लोकतांत्रिक ढांचों को ख़त्म कर निर्णय लेने वाले महत्त्वपूर्ण पदों पर जबरन संघी विचारधरा के लोगों की नियुक्तियां की जा रही हैं। एससी/एसटी छात्रों के स्कूलों समेत देश के ज्यादातर स्कूल जाति, वर्ग व जेंडर आधारित क्रूरताओं को झेल रहे हैं. उत्तर प्रदेश, असम और अन्य भाजपा शासित राज्यों में शिक्षा के भगवाकरण के प्रयास हो रहे हैं. शिक्षा का ठेकाकरण और अनियमितीकरण किया जा रहा है. शिक्षित होने के अधिकार पर हमले के साथ ही साथ संगठित होने और संघर्ष करने के अधिकार पर भी हमला किया जा रहा है. संगठन बनाने के संवैधानिक अधिकार को उठाने के ‘अपराध्’ में मजदूरों को जेल में डाला जा रहा है, छात्रों को ऐक्टिविज़म के लिए दंडित किया जा रहा है और हर जगह जनान्दोलनों को कुचला जा रहा है. सबसे बड़ी विडंबना तो यह है कि प्रधानमंत्री मोदी और आरएसएस अम्बेडकर के क्रांतिकारी दृष्टिकोण को दफ्न करके उनके संदेश को खोखला बनाने में लगे हुए हैं. ‘सामाजिक समरसता’ नाम की अपनी किताब में मोदी खुद ‘समर नहीं समरसता’ का उपदेश देते हैं. उनका दावा है कि अम्बेडकर ने न तो जातिवाद के खिलाफ संघर्ष किया और न ही हिंदू धर्म से दूर जाने की कोशिश की. बल्कि उन्होंने हिंदू समाज को ‘संगठित’ करने की कोशिश की. यह और कुछ नहीं अम्बेडकर के जातिवाद के उन्मूलन के आह्वान का मजाक उड़ाना है. इस तरह भूमिहीन दलितों के जघन्यतम जनसंहारों को भगवा गिरोह समर्थित हत्यारे ‘शांति और सामाजिक समरसता की स्थापना’ का पुण्य कार्य समझते हैं. गिरिराज सिंह और ब्रम्हेश्वर सिंह की तरह ही मोदी और आरएसएस के लिए- (क) सामाजिक ‘समरसता=सामाजिक भेदभाव की स्वीकृति और (ख) दलित और उत्पीड़ित जातियों को ‘सामाजिक भेदभाव’ को चुनौती देकर ‘सामाजिक समरसता’ को भंग नहीं करना चाहिए. उन्हें सामाजिक-आर्थिक-राजनीतिक उत्थान की मांग नहीं करनी चाहिए. यकीन करें या नहीं, 2007 में नरेन्द्र मोदी ने आरएसएस के गोलवलकर की प्रशंसा में लिखे एक लेख में अम्बेडकर को ‘आधुनिक मनु’ बताया. क्या मनुवाद से जीवन भर संघर्ष करने वाले और मनुस्मृति का दहन करने वाले बाबा साहब का इससे बड़ा अपमान कुछ और हो सकता है? इस तरह आरएसएस और मोदी अम्बेडकर का नाम तो रखना चाहते हैं लेकिन जाति के उन्मूलन, संवैधानिक लोकतंत्र, पूंजीवाद विरोध, ट्रेड यूनियन और लोकतांत्रिक अधिकारों के उनकी दृष्टि को मनुस्मृति के जाति, वर्ग, जेंडर अन्याय के साज़िश से बदल देना चाहते हैं. इसलिए आज यह अधिक जरूरी है कि हम अम्बेडकर के वास्तविक संदेश को आगे बढ़ाने के लिए उनके लिखे हुए को पढ़ें और उसके अनुरूप पहलकदमियां लें. तभी हम सांप्रदायिक कॉर्पोरेट फासीवाद के हमले से अपने लोकतंत्र की रक्षा कर सकेंगे. अम्बेडकर के सपनों का भारत कोई बना बनाया ऐसा राष्ट्र नहीं है जहां नागरिकों के लिए सवाल उठाना गुनाह होगा, जहां नतमस्तक जनता से सिर्फ सलामी ली जायेगी। उनकी कल्पना का भारत एक लगातार बनने वाली प्रक्रिया है जहां उसकी सचेत और जागरूक जनता हर गैरबराबरी और शोषण के ख़िलाफ लगातार सवाल और संघर्ष से सम्मान, बराबरी और एकता की राह तलाश रहा हो। इसलिए उनके प्रति सच्ची श्रद्धांजलि का आज मतलब है कि ‘शिक्षित बनो, संघर्ष करो और संगठित हो’ के रास्ते पर चलकर जाति उन्मूलन के लिए, अल्पसंख्यकों के अधिकारों की रक्षा के लिए, हिन्दू राष्ट्र के ख़िलाफ़ और अम्बेडकर लिखित संविधन पर संघी हमलों के विरोध् में एक सतत संघर्ष को आगे बढ़ाया जाए। देश के श्रमिकों, महिलाओं और गरीबों को जकड़ के रखने वाले शोषण के बंधनों को तोड़कर तथा अपने लोकतंत्र को गहराई और विस्तार देने के लिए एकजूट हो जाना ही आज सही मायने में अम्बेडकर के प्रति सच्ची श्रद्धांजलि होगी! Condemn Police Brutality on Jishnu’s Family by Pinarayi Vijayan’s Government! Brutality in Place of Justice for Jishnu’s Family in Kerala! 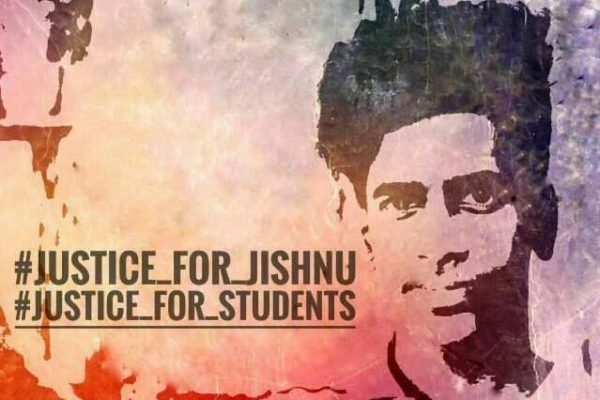 Ensure Justice for Jishnu! End the Spate of Crackdown on Protesters and Dissenters in Kerala! AISA Condemns the police brutality upon Jishnu Pranoy’s family. Jishnu (aged 18) a first year Engineering student of Nehru Engineering College, Pambady, Thrissur, died in mysterious circumstances. While his death is alleged to be a suicide, Jishnu’s family has claimed that he was beaten up in the Vice Principal’s room and blood stains have been found in that room. The postmortem report also indicates marks of physical torture on Jishnu’s body. The Nehru Engineering College is a self-financing college, and self-financing colleges are notorious in Kerala for physical, mental and sexual harassment of students. Jishnu’s friends and family have strongly contested the college’s claim that he was caught copying in an exam – they say Jishnu was beaten and tortured because he questioned why the exam was being conducted by a private agency rather than by the college. When all the accused in the case are wandering free even after three months of the incident, Jishnu’s mother and family seeking justice was dealt with brutally by the Kerala Police. One of the main accused in the case, the chairman of Nehru College continues to get bail while Jishnu’s family members seeking justice face a crackdown. No action has been taken by the government against the police officers who manhandled the peacefully protesting Jishnu’s family including Jishnu’s mother Mahija. Instead of taking action against the police officers, the government including the Chief Minister Pinarayi Vijayan has shamelessly come in defence of Kerala Police. Jishnu himself was a Left supporter. It is indeed shameful that when a government that runs in the name of Left Democratic Front is not only denying justice to Jishnu in his death, but treating his justice-seeking family with utter insensitivity and authoritarian way to shield the accused. Rampant use of laws like the UAPA on independent thinkers and activists as well as encounter killings in Mallapuram indicate the CPIM-led Pinarayi Vijayan government’s contempt for dissent and democratic norms. AISA extends full solidarity to Jishnu Pranoy’s mother Mahija and his family in seeking justice for him. We are also committed continuing the fight against privatization of education, the undemocratic private teaching-shops run in Kerala and all over India the name of ‘self-financing’, and against all attacks on freedom of expression. We believe that to be ‘Left’ must mean to stand for people’s rights and liberties. 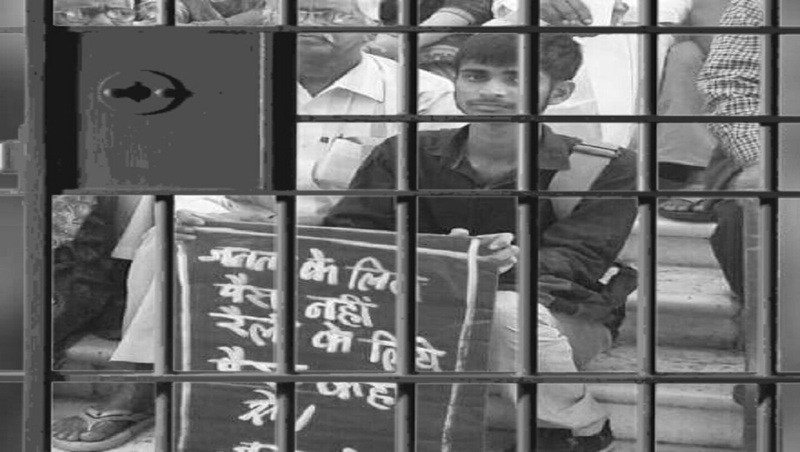 Today, BJP Governments are known for their crackdown on protesters and dissenters. 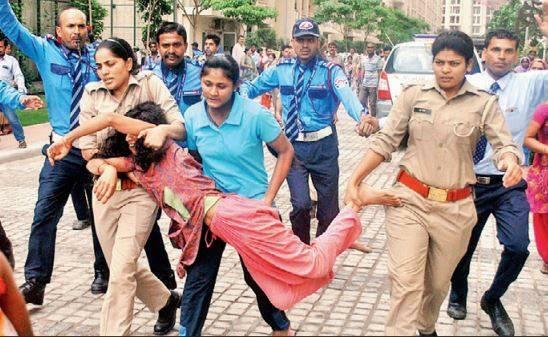 The images of Rohith’s mother and Najeeb’s mother being dragged by the Delhi Police shocked the country. For the LDF Government of Kerala to behave in the same manner towards a mother seeking justice for her son is extremely unfortunate and condemnable in such circumstances. We also wish to remind the LDF government that the people of Kerala elected the LDF government with the hopes of fighting communalism and corruption: the spate of police crackdowns on protesters and dissenters only defeats such hope. 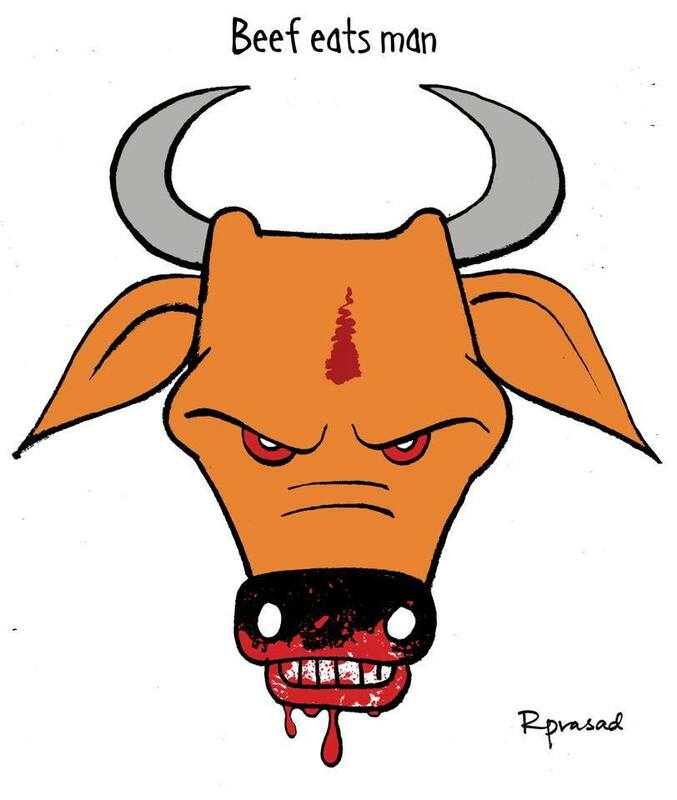 Make no mistake – the cow is the excuse, it is Muslims and Dalits that are the target. The Hindu driver at Alwar was allowed to escape, while the 5 Muslims were thrashed. So this was no spontaneous outrage sparked by concern for cows – it was a cold-blooded murderous communal attack. The Alwar victim was a dairy farmer, had had receipts of cow purchase and licenses for cattle transportation – this proves ‘cow protection’ was a mere pretext. “There is no reason to suppose that Hitler must be a human monster because he passes off as a Nazi…The very fact that Germany and Italy has so wonderfully recovered and grown so powerful as never before at the touch of Nazi or Fascist magical wand is enough to prove that those political ‘isms’ were the most congenial tonics their health demanded.” -Savarkar in his Presidential address to the 22nd Session of the Hindu Mahasabha at Madura in 1940. Muthukrishnan Has Left Us. But The Struggle for Equality Must Go On. The Struggle for Equality against Discrimination and Against Gagging of Alternative Voices Must Go On. Rebuff the UGC Notification and Seat Cuts! Fight Back Denial of Equal Opportunities for the Under-Privileged in Higher Educational Institutions! 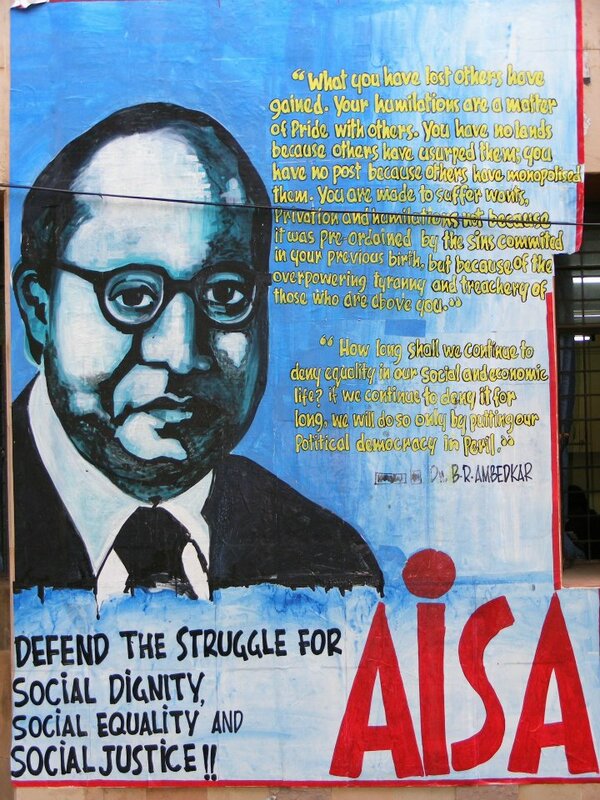 AISA expresses deep shock and grief at the sudden demise of Muthukrishanan Jeevanantham, an M.Phil first year student in the Centre for Historical Studies in JNU. Muthu hailed from a Dalit family who overcame several hurdles to get through the JNU M.Phil entrance exam. We express our support, solidarity and condolences to Muthu’s family and demand a thorough enquiry to probe reasons behind his death. As a first generation learner in research, Muthu had been vocal about the lack of equal opportunities and systematic alienation of the unprivileged in higher education. From #JusticeforRohith, #JusticeforNajeeb to struggles against seat cut and imposition of the UGC Notification, Muthu has been a part of all these struggles. 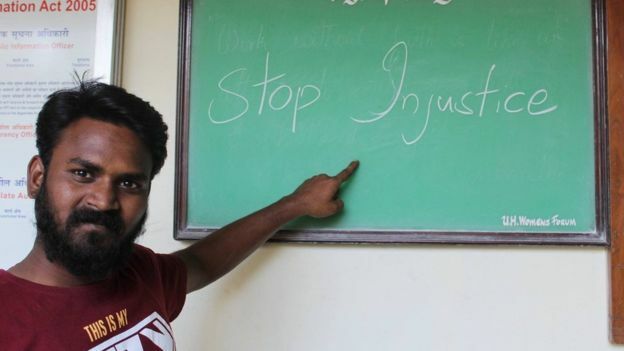 “When equality is denied, everything is denied”, Muthu said in one of his last public posts. While we remember Muthu as a part of the spirited students’ movement of today, his death has left behind several questions for the rulers and administrations. It is more than one year now that Rohith Vemula was pushed to death in HCU after an entire state machinery, including two Union Ministers of the BJP government and the HCU VC, were hell bent on punishing Rohith and his friends for having a political opinion that contradicts that of the RSS. Demand of a Rohith Act resounded all over the country in the course of the mass upsurge that followed Rohith Vemula’s death. We demanded Rohith Act to end caste discrimination inside campuses. We demanded Rohith Act to address the pattern of high drop out of students from marginalised backgrounds. We demanded institutional accountability for segregation of students from marginalised section inside campuses, non-fulfilment of reservation in all sectors, lack of fellowship and hostel facilities and absence of institutions like Equal Opportunity Cells in all campuses. The government has not heeded to the demand till now. On the contrary, committees and enquiries have been set up to question Rohith’s identity itself. Muthu himself has talked about non-implementation of the Thorat committee, which recommended institutional redressal to discrimination and alienation of students from marginalised communities. While the government of the day is in complete denial to recognise discrimination and alienation of unprivileged students, it is the responsibility of the student movement to intensify the struggle for implementation of a Rohith Act. The same regime which denies justice for Rohith and Najeeb when they reach universities has come out with a UGC Notification to cut down seats in research curriculum in Universities. Rather than taking up the task to fulfil existing faculty vacancies and creating more posts to expand the scope of higher education, the UGC Notification is effectively being used to massively cut down research seats in public universities. First they tried to end the research scholarship and now through the UGC Notification, gates of higher learning are being closed for first generation learners like Muthu. Along with this policy offensive Muthu’s generation of students are also fighting the silencing and criminalisation of alternative voices. Hate politics of BJP in power and RSS appointed administrations inside campuses are trying to criminalise students based on what they eat, think or choose. Alternative discourses to mythology and culture are termed anti-national. Talking about communal riots is being banned inside campuses. Hate mongers and assaulters are being set free as has been seen in Najeeb’s case, while sites of protests for demanding rights and equality are being curtailed. Muthu’s death has once again raised the question of alienation of marginalised students in higher educational institutions. We demand that a through enquiry be instituted to look into everything leading to his tragic death. It is time that all institutions including JNU are held accountable for academic alienation of students from marginalised sections. We must demand Social Audit of all universities on admission and dropout rate of students from marginalised sections as well as infrastructure and academic attention provided for them. After 70 years of independence, we cannot allow our institutions to evade the responsibility to keep gates open especially for first generation learners. Universities mean nothing if they do not primarily take up the task of educating students from marginalised sections. This is a time for all of us to look into our spaces and universities and to evaluate how much they are accessible and reassuring to the unprivileged. It is also a time for all of us to continue to challenge the regime of oppression and inequality and to carry forward the struggle for justice, dignity and equality.